Microsoft to Unveil Silverlight for the Xbox? According to the website WinRumors, Microsoft may announce plans to bring Silverlight to the Xbox 360 at the MIX '11 conference next week. Silverlight will act as Microsoft's multi-platform base, bridging the gap between the PC, Xbox and Mobile. A source told the site that Microsoft are planning to create their own app marketplace that will allow developers to scale their applications to work on Windows Phone 7 and the Xbox 360. This also ties in with Microsoft's plans to create an "immersive" touch experience for tablets built directly into Windows 8, sharing a similar Metro user interface to that found on their Windows Phone 7 devices. Windows 8 is set to come with a pre-installed app store that will allow developers to deploy Silverlight based applications, allowing developers to scale software to Microsoft's trio of devices, completing their vision of the three screens connected to the cloud. So what does this mean for Kinect? As we have said before on this site, touch-based games will port nicely to Kinect. We're seeing the beginnings of this with the upcoming release of iOS giants such as Doodle Jump and Angry Birds. Kinect is going to be the natural "controller" of choice when scaling an app from a phone or tablet device to the Xbox. Who wants to play Fruit Ninja with an analog stick? But of course the potential goes far beyond gaming. The variety of apps found on modern phones is astounding and this could finally bring the likes of YouTube video viewing and RSS feed reading to the Xbox all at the flick of a wrist. And it'll hopefully offer an easy way for hackers to get their ideas onto the platform officially, via the upcoming Kinect SDK. The incentive for developers to create an app that will be available to Windows PC and phone users as well as gamers is huge. Lets hope Microsoft's vision can live up to its potential. 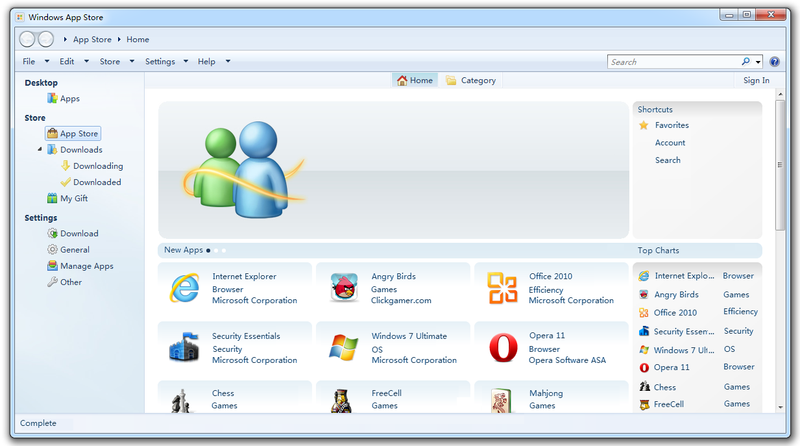 How the app store could look in Windows 7.